What happened in Los Angeles County is only a fraction of what is really going on behind closed doors in almost every police department in America today. This is why so many people have lost faith and respect. The sheer lack of control, integrity, morals and honesty which we expect from the image of a police officer. If you don’t know why the armies of people against “bad cops” has risen then you have not yet been victimized or have someone close who has been. Do you realize how easy it is for police to lie, falsify reports and hide evidence? The fact that our laws can be used against us and to stop us from reporting crimes by police is insane and totally unjust. However it goes on, everyday and our government fails to protect us, investigate honesty, fairly and objectively. It took a huge number of victims before the government did anything, when it takes one dead cop for them to do something against us. Our tax dollars, our public servants being used against us and no one listens when a victim comes forward. In fact it’s worse, if you do come forward and file a complaint or report corruption you’re terrorized, violated and victimized. Read the story of Cary-Andrew Crittenden who came forward with evidence who wanted only to help a disabled woman. He did the right thing and took a stand. What did police do, manipulate the law, commit perjury, falsify reports and steer a jury to find him guilty of a crime he did not commit. The goal to stop Cary-Andrew Crittenden from exposing an entire corrupt Santa Clara County. 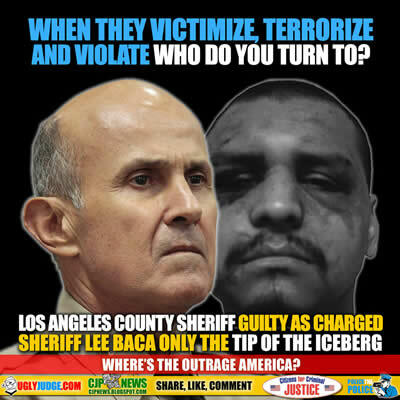 Now that we know Los Angeles Sheriff Lee Baca is guilty as charged investigations and prosecutions should continue and go deeper. Los Angeles County should not be part of the investigation because it’s so badly infected with corruption itself as it is. The question still goes unanswered “When Police, Judges, Lawyers and Government commit crimes or abuse “Who do you call?”. The verdict, which jurors reached on their second full day of deliberations, marked a devastating fall for a man who in his 15 years as sheriff built himself into a national law enforcement figure known for progressive ideas on criminal justice issues. Baca, who is 74 and suffers from the early stages of Alzheimer’s disease, now faces the likelihood of time in federal prison. Speaking outside after the verdict was read, the jury foreman, a 51-year-old salesman from Los Angeles, knocked down Baca’s central claim that he was unaware of the malfeasance others in the department were carrying out.